Our Childrens Rodeo Bull ride is designed specifically for the younger riders who are too small for the normal Rodeo Bull. Its perfect for riders aged 3 - 7years but 8 and 9year olds are welcome to ride it. If all kids are age 8 and over they would be okay on the normal rodeo ride. Our junior ride is designed specifically for younger riders. 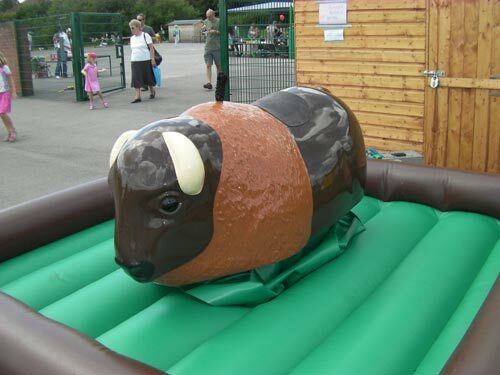 The ride is much closer to the inflatable safety mattress meaning the children are not falling from an unsafe height, the body is smaller meaning the children can sit on it properly rather than being balanced on top of the standard size ride, and there is only a bucking/rolling motion so the child cannot be struck by a spinning bull when they fall. Modern standard Rodeo Bulls like our larger Rodeo Bull are restricted to riders 1.2m or more in height by the liability insurers (note that some older machines run by some other hire companies will have age restrictions of 10 or 12 depending on model) - this is the same with ALL insurance companies irrespective of what some unscrupulous hirers may try to tell you! However, this junior ride is designed specifically for the younger riders so insurance isn't a problem. The ride is supplied with a trained operator and a free inflatable weather shelter is provided for all outdoor bookings and a trophy is provided for the longest ride of the event. The ride requires an overall operating area of 15x15ft with height clearance of 7ft 6in for indoor bookings or a space of 23x23ft if using the inflatable weather shelter outdoors. If outdoor space is limited we can supply a smaller 12x12ft gazebo but this will cover the ride only and not the spectators unlike the inflatable cover. To obtain a competitive quote for the hire of the Childrens Rodeo Bull Ride, or if you have any queries concerning hire, then please don't hesitate to call or contact us and we will be pleased to assist you.